Thanks Mirch! This 2007 'Field work on the Tamar' stamp and cancel features the once world's oldest contested flute. Made from a cave bear femur, it was found in the Divje Babe Cave and dates c. 55,000 years BP. The flute holes have since been debunked as canine punctures. Descriptions of the femur say juvenile, but it drawn with fused epiphyses? Thank you Mirch! 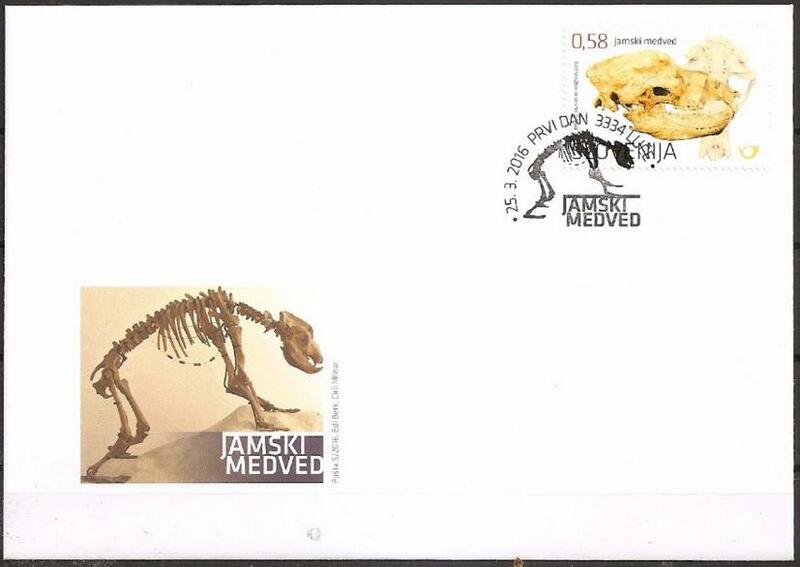 Cave bear skull of unspecified origin and subspecies, from the 'Mammal Fossils in Slovenia' issue. Check out the cachet, the skeleton even includes the sternebrae! Three species of the cave bear lived in Slovenia, with the last ones dying out around 25,000 years ago. Issued: March 25 2016.